The congregation of Escomb Saxon Church would very much like to welcome everyone to this historic church. However, as it is an Ancient Monument there are limitations to the changes we can make to the building to ensure full access for all. Escomb Church is situated at the bottom of a hill in the village of Escomb, on a no-through road with ample parking for cars and coaches directly outside the church. 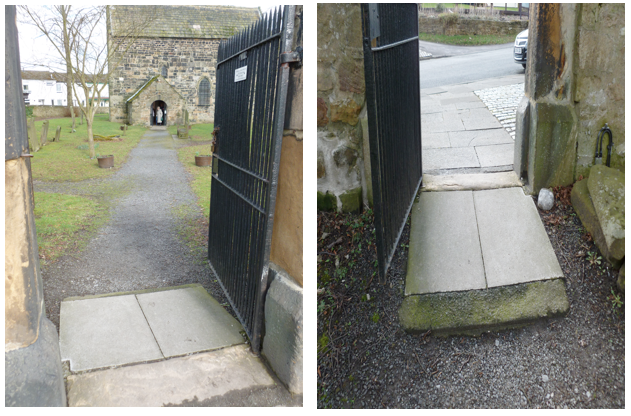 There is a dropped kerb onto the pavement to the left of the church gate. The postcode is DL14 7SX. Keys to the church and churchyard are available for visitors to collect from No 28 Saxon Green, directly behind the church. They hang on a hook by the front door during hours of daylight. There is a flat path from the pavement to the front door. A label on the churchyard gate also gives the location of the keys. Access to the Churchyard and Church There is a semi-step down from the gateway to the gravel path, down a slope. Wheelchair users may need a helper. The path leads to the church porch where there is level entry to the extensive historical / archaeological exhibition. Entry to the body of the church is down two stone steps, the edges of which are painted white. 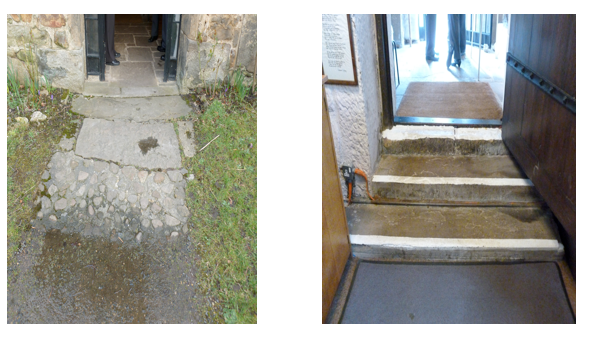 A wheelchair user would not be able to access the interior of the church without help. Once inside the church the nave is all on one level with all parts accessible. The light switches are on the wall to the right of the door on entry. There is a shallow step up to the chancel at the East end. The chancel is 10 ft by 10 ft and can be fully viewed from the nave. Information leaflets and booklets about the church are for sale near the entry and are in English. There are translations of the main guidebook in French, German, Dutch, Spanish and Japanese. A large print, English version of this text is being produced. There is a hearing loop in church and a PA system is used for all services. Outside the church the gravel path circles the church so all aspects of the building can be viewed on the level. There are two wooden benches in the churchyard. Facilities: There is no WC in church and no public conveniences in the village. Church visitors are welcome to use the facilities in the Saxon Inn opposite the church during pub opening hours. Prior permission of the landlord has already been granted. Access to these facilities is a little limited. The back door of the pub is ramped and the men’s toilets are fully accessible. There is a sharp right angled turn into the Ladies with a gap of only 24 inches. Women in wheelchairs may use the Mens, which will be cleared by the staff on request. There is no disabled toilet. For further information contact the landlord on 01388 662256.